And on this note, I’m hoping to be able to charm you with this simplest of all recipes; a beautiful dish that consists mainly of bulgur and chickpeas topped with a heavenly delicious قدحة – [qadha], which is coriander and garlic sautéed in olive oil, and served with some yummy goat yogurt (goat yogurt has a different yet particular taste to it, and I do believe that once given a chance, goat yogurt will become an all time favorite). Mix the ingredients in a medium bowl, then serve immediately. Enjoy! I remember when I was a kid, I used to get confused between fresh coriander (cilantro) and parsley as their leaves look very similar, despite the very distinctive flavour and aroma of coriander. Of course that is no more the case (fortunately! ), but now I find it amusing to ask my kids to tell the difference between them when we go grocery shopping. But the truth remains that till about a decade ago, I was never in love with coriander. And it was only after I met Ali, my husband, that I discovered my hidden love for this most amazing herb. For the way he finds pleasure in adding fresh coriander to different kind of dishes intrigued me and made me want to do my own discoveries. Now, obsessed with coriander, I not only add it to as much recipes as I can, but I even find myself creating recipes with coriander as its main ingredient. However, it seems I’m not the only to have (or to ever have had) a crash on coriander. Most probably native to the Mediterranean basin, this herb and its seeds seem to have been the obsession of different civilisations, like the Pharaohs and Greeks, for both their culinary and medicinal uses. To prepare the meatballs: in a large frying pan, heat the olive oil then sauté the chopped onion for a few minutes stirring continuously till onion has browned a bit and soften. Add the garlic and chopped coriander and sauté for one minute further. Pour the mixture into a large bowl then add the meat, sweet spices and season with salt & pepper. Mix well using your hands, then shape the mixture into bite-size balls (about 32 – 36 small balls). Using the same frying pan, cook the meatballs over medium heat, stirring often, for about 8 – 10 minutes (or till balls are golden brown). Remove the meatballs from the pan and keep in an air-tight container to keep them warm while preparing the coriander sauce. To prepare the sauce: still using the same pan, sauté the chopped coriander and garlic for a couple of minutes before adding in the pine nuts. Season with salt & pepper and cook further over low heat for about 5 minutes, stirring continuously. Return the meatballs to the frying pan, add the meat stock and cook further over medium heat for about 15 minutes. Serve right away with plain white rice or with some nice fresh pita bread! 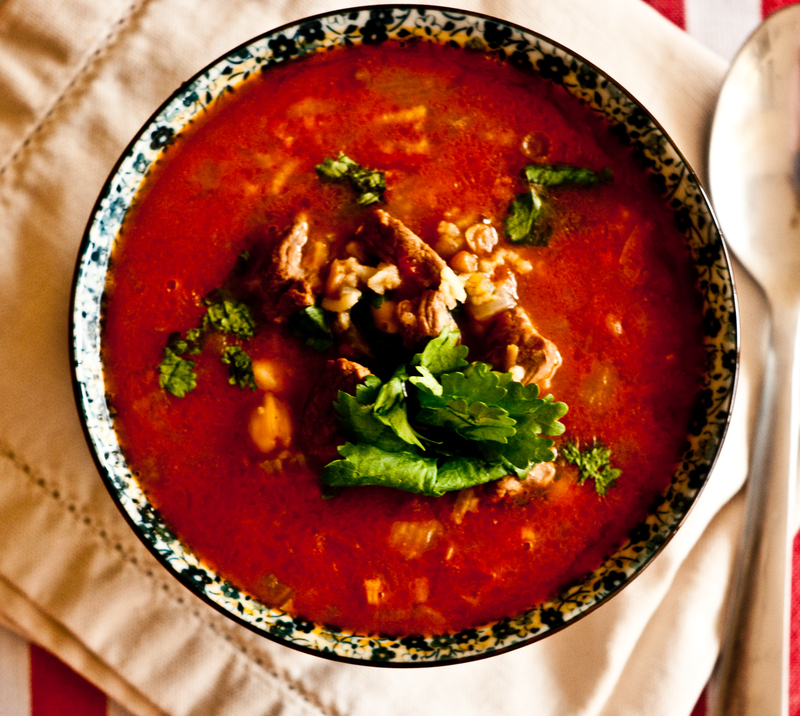 Originating from Andalusia الأندلس, Harira حريرة is a heart warming soup that made its rich journey all the way to North Africa, namely Morocco and Algeria, to become yet another magical flavor of the exquisite North African Cuisine. Widely prepared during the month of Ramadan, and during the winter season (which is far from being the case in Dubai), this beautiful food brought me comfort and peace after a few stressful and busy weeks. And it was one of those kinds of dishes that fill your home, and heart along, with beautiful aroma. This soup takes some time to prepare (mise en place of the ingredients). But once you start bringing this soup together (mainly when adding the saffron to your soup basic mixture and having the magical smell of oriental spices invading your kitchen), you realize that this soup is so worth the work and that it just cant go wrong. I have to admit though that it would normally be more interesting to work with dried chickpeas (about half a cup chickpeas soaked in water overnight), but I went for the road more taken and thus took the easier option (canned peas). Sorry! In a large saucepan and over medium heat, heat the butter and olive oil, till butter has melted, sautée the onions, celery, and garlic. Stir with a wooden spoon for about 5 – 7 minutes, till onions start to soften. Add in the ginger, cinnamon, pepper, and saffron. At this magical moment, the smell will tell you you are on the right way to heavenly food. Cook for a couple of minutes before adding the diced lamb meat. Sautee for about 5 minutes stirring continuously till meat is brown. add the chickpeas and tomatoes and cook for another 5 minutes. Pour the chicken stock and water into the the pan. Bring to a boil, then lower heat and let cook for about 20 minutes. Add the lentil and cook for another 15 minutes before adding in the rice. Cook further for about 10 – 15 minutes. Remove from heat and add the lemon zest, juice and coriander. 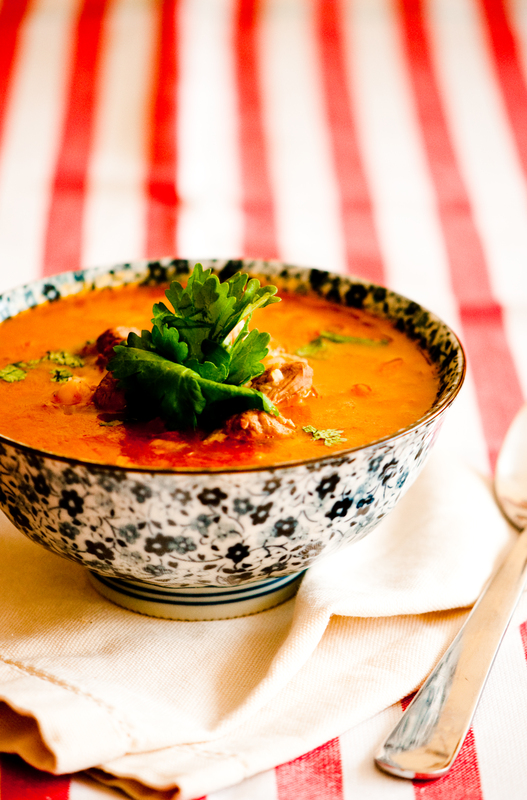 Give it a stir before serving the soup garnished with coriander leaves.